Celebrations 2 Confetti. Confetti sold by volume not weight. 2 inches x 3 inches resealable bag. 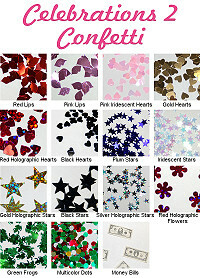 Packages available: Red Lips 1/8 inches, Pink Lips 1/8 inches, Pink Iridescent Hearts 1/8 inches, Gold Hearts 1/8 inches, Red Holographic Hearts 1/8 inches, Black Hears 1/8 inches, Plum Stars, Iridescent Stars 1/16 inches, Gold Holographic Stars .25 inches, Black Stars 1/8 inches, Silver Holographic Stars, Red Holographic Flowers, Green Frogs 1/8 inches. Multicolor Dots available in Red, Green, and Gold. Money Bills available in $10, $50, $100 Bill Confetti. Each Bill is Approx. 0.75 inches.